As a church-going atheist, I was very pleased to hear of this not-a-church "Sunday Assembly". It now means I have four different congregations to visit each month. One is quite spiritual, but also agnostic. Another is extremely political, and not very religious. A third is nominally Christian, but more interested in psychoanalysis and self-healing. And the fourth? Well, we're standing in it, and it is based on a very beautiful statement: "Live better, Help Others, Wonder More". Such an appeal suits my love of philosophy. Around twenty years ago, I received a stiff piece of cardboard that said that I had a degree of expertise in loving philosophy, and since then I've continued this practise, often autodidactically by talking to the strange daimons in my head, sometimes with other people, and often at a group I convene entitled "The Philosophy Forum". 1.1 Most of the history of philosophy has been strongly associated with theology and metaphysics; allinvolve making universal claims about the nature of reality with the traditional classification in Aristotle consisting of ontology (the study of being and existence), theology (the study of the Gods, the existence of the divine, creation, etc), and logic. But much of metaphysics came under criticism with modernity; David Hume argued that much was merely "sophistry and illusion". Many metaphysical questions - considered important for hundreds of years - were considered unprovable, especially following Kant's limits to knowledge. 1.2 In the late 19th century there were the first rumblings of a major revolution in philosophy; American pragmatism (pragma - deed, act from prasso, "to achieve). Consider Peirce's axiom "Consider what effects, that might conceivably have practical bearings, we conceive the object of our conception to have. Then, our conception of these effects is the whole of our conception of the object." (Popular Science Monthly, v12, 1878). It is a philosophy that make propositions which work, with derivations from empiricism and utilitarianism; it links practice and theory. Initial advocates includes William James, (The Varieties of Religious Experience, 1902, Pragmatism: A New Name for Some Old Ways of Thinking, 1907), John Dewey (Democracy and Education, 1916, Knowing and the Known, 1949), George Herbert Mead (Mind, Self, and Society, 1934). William James encapsulated the pragmatists opposition to metaphysical speculations with the remark: "If no practical difference whatever can be traced, then the alternatives mean practically the same thing, and all dispute is idle." As we know the word "heretic" derives from the Greek hairesis (hah'-ee-res-is), meaning choice. But not just any choice although we may refer, often in humour, to a person who does not conform to any established attitude or principles or even styles and tastes as a "heretic". That is not the sort of heresy that makes up today's discussion and nor does it constitute a 'heresy' in the historically understood meaning of the term. A real heresy, religious or political, is a position that challenges an existing totalising system, not just on matters of doctrine, but also its authority. "Some of my friends have suggested that such a scheme of town clusters is well enough adapted to a new country, but that in an old-settled country, with its towns built and its railway 'system' for the most part constructed, it is quite a different matter. Is Islamic Jihad Comparable to Buddhist Mindfulness? Read more about Is Islamic Jihad Comparable to Buddhist Mindfulness? Misattributions are unfortunately commonplace. However their prevalence should be not be an excuse to let them go unchallenged. In a public sense, a misattribution can harm the reputation of a speaker as defamation (typically libel in the written form, slander in the spoken). In a political sense, misattributions are used to improve or denigrate organisations, policy proposals, etc. on the basis of an appeal to authority; in this case, the damage isn't limited to an individual, but rather to the capacity of the society as a whole to make rational decisions. Academics typically have very little tolerance for misattributions, seeing it as a type of falsification of data, and all that follows. Perhaps one of the best collections is the highly recommended They Never Said It : A Book of Fake Quotes, Misquotes, and Misleading Attributions, was compiled by Paul F. Boller Jr. (Emeritus Professor of History Texas Christian University, Oklahoma), and John George Jr. (Professor of Political Science and Sociology Central State University) and was published by Oxford University in 1989. With the advent of social media the capacity to distribute such falsehoods is, of course, amplified. The combination of a general sense of information overload plus an enhanced capacity in distribution provides opportunities for an enticing quote (subject to confirmation bias), added to a pleasing image, along with superficial "voting" methods (such as Facebook's "like" button or Google's "+1") and capacity to "share". As a recent example, a friend added a picture of Albert Einstein with the quote: "If the bee disappeared off the surface of the globe then man would only have four years of life left." 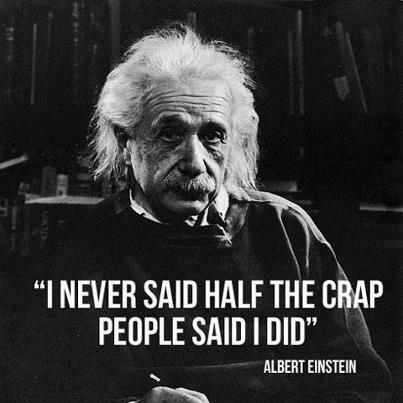 Now being slightly familiar with the works Einstein, it just didn't sound like him. Call that a hunch; a subsequent google search reveals over three million references to the quote. But how accurate is it? It was Darwin who first proposed an evolutionary theory of beauty. He surmised that art fulfilled two evolutionary functions. In respect of general selection, beauty is related to fitness. It also plays a part in sexual selection: the female selects the male on the basis of aesthetic criteria: think, for example, of the peacock’s tail, the bowerbird’s nest. Read more about Art Instinct? Initially I felt some unease when approached to present today's address on 'isocracy'. I do not particularly care for presentations here which are solely dedicated to political issues that do not refer to our liberal religious tradition, least of all by members of the church. If I want strictly social and political discussion there are these organisations called "political parties" where one's contributions are far more useful and effective.